Jupiter is transiting from Pisces to Aries on 08th May 2011 and it will remain in Aries for about a year, till 17th May 2012 to be precise. “Will Jupiter’s change of Zodiac Signs bring you health and wealth? Or could he actually bring you sickness and hospital bills? One of the Sanskrit names for Jupiter is “Guru” which means teacher. Jupiter is also known as ‘Brihaspati’. In the ancient Vedic texts, it is even said the Jupiter is the prime advisor to the celestial angels or “Devas”. Jupiter removes our ignorance and darkness and offers wisdom. This planetary lord is also the god of righteousness and justice. Jupiter takes about 12 years to complete cycle of 12 zodiac signs. It stays for about a year in each sign. Whenever Jupiter moves in to 2nd, 5th, 7th, 9th and 11th houses from the Janmarashi we can say that the native has Gurubala and it gives good results. Just as the guru removes the problems of the devotees, the planet Guru brings fortune for most people across the board. The placement of Guru in the 9th house is extremely beneficial. The person with a 9th House Guru will overcome all problems and become successful in a miraculous way. Jupiter is the significator for wealth, children, education, religion, prosperity, fame, gain, good marital order, providential help, political power, good luck, finances and long journeys. In Medical astrology Jupiter rules: blood, liver, arteries, thighs, neck, weight problems, diabetes, cataract, intoxication, biliousness, cholesterol. New good friendship, Divine support, outstation / overseas business travel fruitful. Loss /Lack of money. Debts. Solitude. lost position and status. Do not involve in arguments. Gain in position. Expansion of Business. Increase in number of friends. Even enemy turns to be a friend. Regaining lost things.Good news. Honors. Fulfillments of desires. Good profit in all undertakings. Good understanding in the family. Spiritual deeds. Gains through contacts. Good rapport with statesmen. Ailment in the back bone. Ill fame in profession. You would not be able to accumulate money. circulation of money. Affluence. Dedication. Gain for father. due to pledging or Mortgaging properties. Ailment in the excretory system.Accidents. Loss of reputation due to corruption. Students need to put in hard work. relations. Success in profession. Auspicious deeds in the house like, Marriage for self / son / daughter. Dip in business prospects. More care towards Mothers health. Extensive trading. More Dedication towards work. Will get faithful servants. Sorrow.Misunderstanding with partner. Lack of memory.Loss of valuables. issues. Firm Dignity. Gains from paternal property. Transfer (place) in Job. Honors. Blessings of Saintly people. False allegations Quarrels and disputes with relatives. Unfavorable to father. Expenditure towards children health. Ailment in the chest or breast. Litigation in property. Possibilities of meeting with accident. Strong divine faith. Misunderstanding between the spouses. Caution while undertaking journeys. Reference Point: The reference or starting point is the Janmarashi or the sign in which the Moon is posited in the natal chart. There are many astrologers who advocate interpretation with reference to Lagna or Ascendant but the classical texts recommend using Janmarashi only. Lordship of Jupiter in Natal Chart: It is important that we should identify the lordship of Jupiter in the natal chart before we set out to make any predictions. For example, for a native whose Ascendant is Pisces and Janmarashi is Gemini May 2011 transit should be interpreted to give specific results pertaining to the Karakatwa of First House and Tenth House apart from the general prediction given above of Jupiter being in the 11th house during transit. Dasha and Bhukti: Whatever interpretation we arrive at using above method must be corroborated by the Dasha and Bhukti currently running for the native. If the Dasha and Bhukti are not favourable then the results thus predicted may not come true. 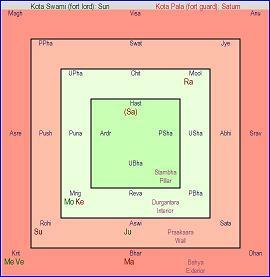 Conclusion: The transit interpretation though appears very simple; it involves in-depth analysis of afflictions, retrogression and ownership of Dusthanas / Bad Houses of Jupiter in natal chart as well as Veda (Obstruction) to Jupiter in Transit and the result obtained from the transit of other powerful planet, namely Saturn. Notwithstanding all these, Jupiter being the most benefic planet will normally not harm any native unless he is highly afflicted. As stated earlier Jupiter is the promoter par excellence, and I wish that all mankind receive his blessings for peace and harmony. The year 2011 is an important year wherein four major planetary transits are taking place. All these transits will have profound effect on individuals depending on their Janma Rashi. You are said to have Gurubala when Jupiter is in 2nd, 5th, 7th, 9th and 11th from your Janma Rashi. This transit will be unfavourable for Aries, Taurus, Cancer, Virgo, Scorpio, Capricorn & Aquarius. There is no need to be scared if the results are unfavourable because if you are running good Dasha & Bhukti many of the negatives will be corrected. Propitiating Lord Shiva on Mondays and Thursdays will mitigate many problems. Detailed results for each Rashi will be published nearer the date. All these malefics are good in 3rd, 6th and 11th from your Janma Rashi. For Saturn, the transit will be favorable for Leo, Taurus and Sagittarius. For Rahu, its transit will be favourable for Virgo, Gemini and Capricorn. For Ketu, its transit will be favourable for Pisces, Sagittarius and Cancer. Saturn – Lighting Till Oil lamp / Pooja to Lord Shaneshwara on Saturdays. Rahu – Pooja to Goddess Durga on Fridays. Ketu – Pooja to Lord Ganesha on Saturdays. Note: As said earlier, if you are running good Dasha & Bhukti, many of the negatives predicted by this transits may not happen. Please check your horoscopes / consult an astrologer.